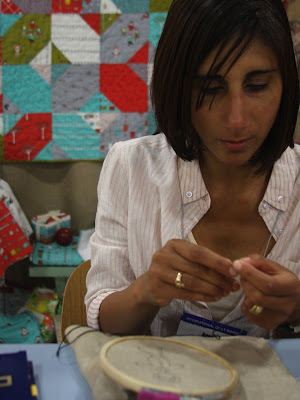 The Fat Quarter Shop is excited to welcome Aneela Hoey to the Jolly Jabber. 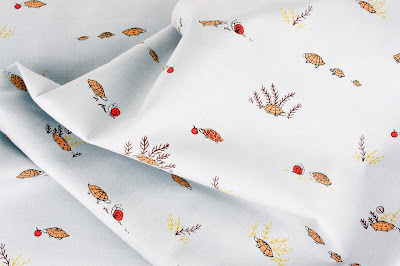 Aneela’s latest fabric collection is Little Apples from Moda Fabrics. Q: What was the first seed that grew into the Little Apples collection? A: Little Apples was inspired by my two little girls, their hobbies, habits and memories I have of them growing up. These three pictures show some of those inspirations - The first shows my youngest daughter who has an obsession with plaiting (braiding) her hair and anything else plait-able in sight! The middle pic shows my little one again as a baby wearing a beautiful red velvet coat I got her (there is always a girl wearing a red coat/dress/cape in my designs!). The third pic shows my eldest daughter on her eighth birthday busy with her favorite presant that year - a hoop from her auntie. All these memories and others were idea's that were worked into this collection. A: The 'Tortoises" (turtles) print - I really enjoyed designing this one, with tortoises hiding in the grass or talking to snails and even a little family of them walking in line. The print has a nice small scale for a conversational and lots of fine line quality. I'm planning on making a few things for my daughters as well as items for the kitchen from this design as it makes me smile (and that might get me spending more time in the kitchen!). A: I would but I'm still waiting to see it myself! A: My Pickledish quilt (actually it's a double wedding ring, I have no idea why I called it a PD). I made it using Sherbet Pips as well as lots of my other favorite fabrics. I also hosted a quilt along whilst I made mine and you can find out how to make your own here. A: I probably do my best thinking while sketching out idea's and also when just doing the everyday things like washing the dishes or walking up to school to get my daughters. A: Probably some fancy french style pastries, something like a tart with a creamy filling and strawberries and cream on the top. A: I was struggling with this one so I asked my eldest daughter, who said immediately 'Too much fabric!!!!"